FIGURE 6-14 Cutaway view of an automotive catalytic converter. The honeycomb (enlarged, bottom left) contains 300-4000 square channels per square inch on which the metal catalysts are coated. Emissions pass through these channels and react on the catalyst surface. Provided by R. J. Farrauto, Engelhard Corp., NJ. effectiveness of the catalytic converter. 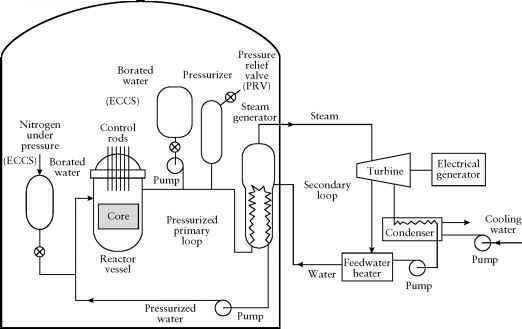 Ideally engines could be operated under oxidizing conditions that would permit efficient fuel consumption, resulting in the consumption of most of the hydrocarbons and CO. At the present time, however, there is no practical way to eliminate the NO* formed in the absence of a reducing agent to convert it to N2. The 1990 amendments to the Clean Air Act mandated that emissions be reduced to even lower levels by 2004 and that the catalytic converter have a useful life of 100,000 rather than 50,000 miles. Emission standards more stringent than the national ones have been adopted by California and eleven northeastern and middle Atlantic states. A major step toward meeting the new emission standards will be the development of a catalytic converter that is operative when the engine is initially started. About 50% of the emissions from an automobile engine, as measured in a standard test procedure, are emitted during the first 100 s when the catalytic converter is being brought to its operating temperature of 400-600°C. Placement of the catalytic converter closer to the engine will result in a faster warm-up, but the converter will have to be reengineered to operate at about 1000°C, a temperature at which the present catalysts are inactivated and the ceramic core is not stable. In addition, the reduction of NO* is less efficient at higher temperatures. One possible solution is to electrically heat a portion of the catalyst when the car is started. The catalyst in a forward compartment of the converter would be coated on a metallic core that can be electrically heated to 400°C in 5 s by using power from the alternator. The remainder of the catalyst would be layered on a porous ceramic core as shown in Figure 6-14. Other possible solutions include the development of catalysts that are active at lower temperatures and the use of zeolites and other materials placed in the exhaust line before the converter, which adsorb the gaseous emissions when cold and release them when the operating temperature of the converter is reached. 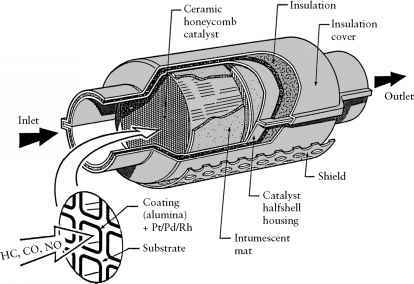 Meeting the requirement that the catalytic converter last for 100,000 miles will also require new catalyst formulations that are not poisoned by zinc, phosphorus, and sulfur, as are the present formulations. These elements are present in zinc dithiophosphate, a compound added to lubricating oil for the reduction of engine wear. Finally, there is active research on the development of better catalysts for the reduction of NO*. This would make it possible to run the car engine at an air/fuel ratio of 18-21 instead of the stoichiometric conditions used currently (Figure 6-13). An air/fuel ratio of 18-21 results in the more complete combustion of gasoline to carbon dioxide and greater fuel economy as well. How much platinum is in a cadillac converter? How to use of catalytic converter in power plant?